It's not just students who need to brush up on their writing. 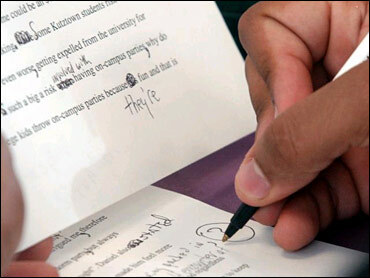 A majority of U.S. employers say about one-third of workers do not meet the writing requirements of their positions, according to a survey by the College Board's National Commission on Writing. "Businesses are really crying out - they need to have people who write better," said College Board President Gaston Caperton. While writing has always held a spot in American education as one of the three Rs, many say writing clearly and accurately is more important than ever - and not all workers are up to the task. In a fast-paced workplace, precision and brevity are essential. For e-mails, reports and presentations, the commission found that accuracy, clarity, spelling, punctuation, grammar and conciseness ranked among the most sought-after skills. "There's no way to say that writing has gotten worse," said Susan Traiman, director of the education initiative for the Business Roundtable. Rather, "the demand has gotten greater." The commission surveyed Business Roundtable members in six sectors - mining; construction; manufacturing; transportation and utilities; services; and finance, insurance and real estate. Two-thirds of salaried workers in large U.S. companies have jobs that require some writing - and this includes some of the most technical occupations. "Writing skills tend to be critical more on the salaried side of things, but even for our hourly jobs, to be able to communicate shift to shift," said Thomas Siegele, a human resources manager for paint and glass maker PPG Industries Inc., based in Pittsburgh. William Raney, president of the industry group West Virginia Coal Association, said writing skills are necessary for such varied groups as electricians, engineers and foremen, who often draft proposals for government agencies and regulatory bodies. "There's a great need to translate the technical to the practical," Raney said. A majority of survey respondents said about two-thirds of employees - both current workers and new hires - meet writing requirements. However, about one-third of respondents said one-third or fewer of current and new employees met those requirements. While lackluster writing skills do not necessarily impede success in all fields, more than half of the companies surveyed reported that they assess writing in hiring and promoting salaried employees. The College Board, which administers the SAT, PSAT and Advanced Placement tests, says the responsibility lies with grade schools and universities - but training represents another potential solution. "You're never too old to learn," said Bob Kerrey, co-chair of the writing commission and president of the New School University in New York City. "It's a skill that is acquirable." The survey was mailed to 120 resource directors in corporations affiliated with the Business Roundtable. Sixty-four companies, or 53.3 percent, responded, representing nearly 4 million employees.